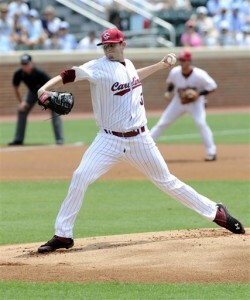 The South Carolina Gamecocks Jordan Montgomery tossed a four-hit shutout to beat the North Carolina Tar Heels 8-0 and even the Chapel Hill Super Regional at one game apiece. Montgomery struck out three and walked one throwing 121 pitches to improve his season record to 6-1.The deciding game three will be played tomorrow with the winner advancing to the College World Series in Omaha. Joey Pankake drove in two runs during a five-run second inning for the Gamecocks (43-19) in the second inning which turned out to be more than enough run support for the win. North Carolina won the first game of the series 6-5 with an RBI single in the ninth, putting them within one win of returning to Omaha for the sixth time in eight seasons.